Update your home with this gorgeous Brandymill Hickory Autumn engineered wood flooring by Mohawk. This elegant wood flooring option features a beautiful reddish-brown tone that makes any home look warm and inviting. The hand-scraped, distressed look of the wood creates a vintage appeal that's absolutely stunning in any space. These Brandymill Hickory Autumn panels measure 5" wide each and come in varying lengths, making them great for filling in smaller spaces. Brandymill Hickory Autumn flooring features a crystal shield aluminum oxide finish that helps these floors to look beautiful for years and makes them easier to maintain. 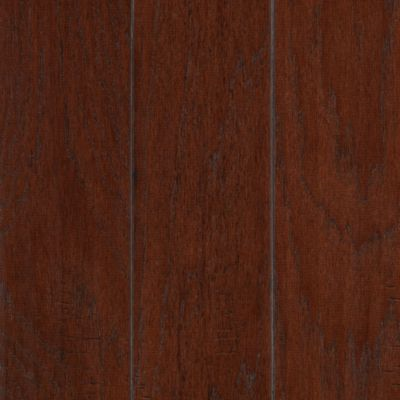 The finish is smooth and sleek, so it feels comfortable underfoot while adding to the durability of your floors. Order this Mohawk Brandymill Hickory Autumn engineered wood flooring from iDeal Floors to get high-quality flooring at a competitive price. Our family-owned business is built on our dedicated to customer satisfaction, so don't hesitate to contact us with any questions.